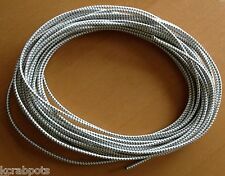 Bungee Cord has an elongation or stretch of 120% /- 15% (a 6" piece would stretch to 13.2" in length). MADE IN THE USA! Has a few very minor stains, but overall seems in nice condition. Here are 2 Used Signed Mariner Boat Cam Cleats. Each is 5" Long. Still lots of life left. I Want YOU to be Satisfied. Mounts onto bulkheads or locker lids. MADE FROM Forged Aluminum and Plastic. BLACK handle with black grip. Grip: Single ball bearing handle. Color: Black handle with black grip. Material: Forged Aluminum. This is in good working condition. If you need any more pictures feel free to ask. This Friend tiller extension is in very good condition. It is extendable from 642-935mm. Included are the hinge with screws. We have been sailing Hobies for over 40 years, starting with a 1971 Hobie 16, sail number 910. We still have a Hobie 21 at Brookville Lake, Indiana and still loving it. Call the Hobie Experts at Strictly Sail Inc.
C&C30 All parts for sale, Yanmar 3GM, painted mast and boom, sails, cushions, Rod rigging harken furling system new stanchions lifeline ECT. 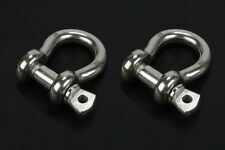 The unique shape of the anchor shackle with its circular bow section allows the shackle to mitigate the weakness of a chain shackle. An anchor shackle is ideal for applications where two lines often move about and directional load is unavoidable. Jib Sail: 11'x 12' x 6'. Condition is Used. No tears or rips. Used only in fresh water. Please see photos. Harken® ball bearing cam cleats hold lines securely and release instantly for easy, precise trimming. Pawls Aluminum. Breaking load (kg) 454 kg. Maximum working load (lb) 500 lb. Maximum working load (kg) 227 kg. I have not attempted to bleach these stains out, so I do not know if permanent. Foot = 80". Luff = 155". Material: 316 stainless steel. 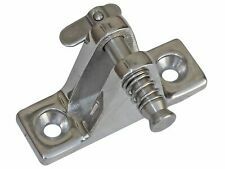 - Made of marine grade 316 stainless steel, very strong, high load, corrosion resistant and excellent wear resistance. - Progressive cam tooth design ensures maximum retention of all types. 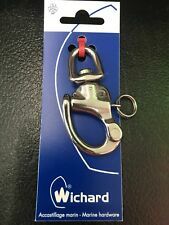 Nicro Marine NM (now Ronstan)Snap Shackle, Swivel Bail in Very Good Condition (see photos). 3/4" inside bail (photo 6). Excellent Working, Smooth Swivel, Strong Snap. Ask for special needs. THIS IS A COMPOSITE BALL BEARING CAM CLEAT WITH FAIRLEAD. PRODUCED IN THERMOSET COMPOSITE, HAS 8 YEARS WARRANTY AGAINST WEAR GROOVES CHESTNUTS. HARDNESS AND STRENGTH COMPARABLE TO ALUMINUM. Mainsail for a Thistle by Thomas sailmaker Cleveland. White with blue accents. # 3763 on sail. They may vary - 2". 7/16" Nylon Sail Slides Slugs (Set of 10). 7/16" Nylon Sail Round Slides Slugs. related products. PRODUCT NUMBER: FO-2870. code 3027-1. Seam to be in good condition. To remove, you squeeze and remove the handle in one motion. Cam cleat is 1 7/8" long, 3/4" high, and 15/16" wide. Our Cam Cleats are made of a UV Stabilized Composite with Glass Fiber reinforced Base.A Strong long lasting unit with reversible Cams. Should the teeth ever wear out simply reverse them for many more years of service. For when the application does not require the snap shackle to be frequently removed, the eye swivel snap shackle is your shackle of choice. If the shackle does require frequent removal while maintaining a secure connection, our jaw snap shackles are perfect for the job. They are priced EACH. Local pickup is always available and free of course. BUNGEE SHOCK CORD. HIGH TENACITY MARINE GRADE. 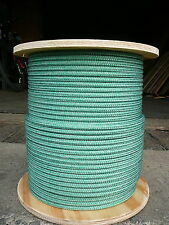 - 1/4" X 50' LONG CONTINUOUS ROLL (NO CUTS). MADE IN USA FOR QUALITY . Should a problem arise with an order, we will make it right. 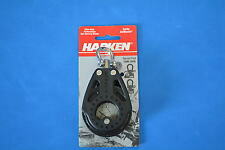 Pair of Harken 280 Cam-matic sailboat deck cleats. NO RESERVE. Hole pattern is 2 5/16 X 1 1/8. • Closed Length(pin to swage end) 6.9", Open length(pin to swage end) 9.65". Swage Fork Turnbuckle. 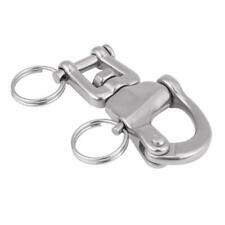 • Made of marine Grade 316 Stainless Steel for maximum corrosion resistance and durability. • Suitable for outdoor or indoor and has an excellent shine and radiance to it. For Sale: Cruising/Racing Main. SOLD AS IS. This Five Oceans Wind Indicator 14 1/2" is an overwhelmingly popular choice for all cruising and racing boats 15FT and bigger. Wind Indicator with Sensitive Ball Bearing, 14 1/2". DESIGNED specifically to provide the helmsman with accurate information of the apparent wind direction. Shackle Dia. Bail Size 5⁄8". Overall Length 2-11⁄16". Price is for each (1) unit . Drum - 2-1/4". BOOM VANG, VERY GOOD CONDITION. THEY FIT 99.9 PERCENT OF ALL SAILBOAT TILLERS. I GAURANTEE A GOOD FIT. MADE IN THE USA. 1/2" THICK AT END (PHOTO 6) & FORKS ARE 1/4" THICK. 1-1/8" WIDE (PHOTO 7) & 1/2" INSIDE. 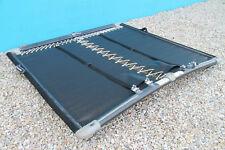 I have a used mainsail batten set from my Hobie 16. No longer need them. They have leech tips and some duct tape on the luff ends. %100 functional. Whole set. I do have a few extra battens I will throw in for free if you want them. For shipping, after the auction is over, I will be in contact with you to find the best/cheapest shipping method for you since that will, most likely, be the biggest expense. I do have a used Hobie 16 boom up as well on another auction if you're interested. Happy sailing! (C0747-LK03-X). THIS KIT INCLUDES THE FOLLOWING. UNICORN STAINLESS INC. While recreational sailors might live for the pure adrenaline rush that accompanies flying a hull or stemming the tide out on the open water, true sailing enthusiasts derive just as much pleasure from maintaining and adjusting their boats. Sooner or later, every sail boater will want to tune the rigging or replace a few cleats and pins, and on occasion, boat repairs will need to be made miles from port. A knowledgeable sailor can prepare for many eventualities in advance by keeping essential hardware and the most critical sailing gear at the ready. How do you select sailing hardware and gear? Conduct an inspection: A visual stem-to-stern inspection of your sailboat may expose worn or broken blocks, cleats, shackles, pins, rigging, and other fittings. If the condition of your hardware is questionable, plan to replace it or procure the appropriate parts to carry along on your sailing excursions. 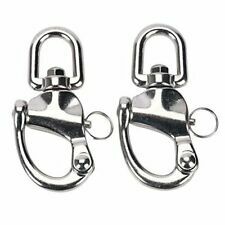 Determine the correct size: From cams and cleats to spinnaker poles and shackles, sailboat hardware and accessories are available in a range of sizes to fit seagoing vessels of every description. As a general rule, the size of your boat will determine the size of the line that you use, and the size of your line will determine the minimum size of your blocks, cleats, shackles, and many other parts. Choose a material: Some hardware is available in a variety of materials, including wood, stainless steel, galvanized steel, aluminum, and nylon. In some instances, choice of material is a matter of personal preference; in others, your choice may be dictated by whether you sail on fresh or salt water, which is corrosive. What sailing gear and equipment should you have on board? A well-stocked toolbox is a must-have piece of equipment whenever you head out to sail, and a two- or three-tool rigging knife is invaluable. Weather-resistant clothing, life jackets, a marine light, and flares are other gear that no sailboat should cast off without. A ship-to-shore radio, extra line, extra hardware, and an outboard motor in good working condition are also high on most sailors' lists. What other equipment do sailors need?